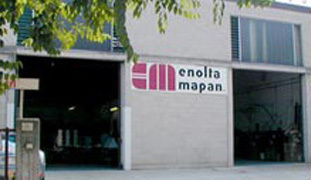 Since 1978 Enolta Mapan has been making machines for the wine and oil sector. It started out working in Brescia in via Bettole and already back in the 1990s it had to move to a larger location, where it currently resides in Borgosatollo, at the gates of the city. Therefore the company was founded and manufactures in the Brescian territory, a land of great wine cultivating traditions, as proven by the celebrated wines of Franciacorta and the wines and oils of the Lake Garda area, for example. It is also an area of great technological traditions, with universally renowned brands. Enolta Mapan, specialised in the designing and building of corking and caging machines, offers a range of semi-automatic and automatic wine machines, designed to meet the needs of small and medium size companies. Our professional corking machines are exported all over the world and our clientele knows it can rely on our skills and the quality of our products. We recently completed the range by introducing the manual corking machine, so we could also meet the needs of private producers. Our machines were designed to cork bottles of every kind, with stoppers in cork, synthetic (also called plastic stoppers) and agglomerate. 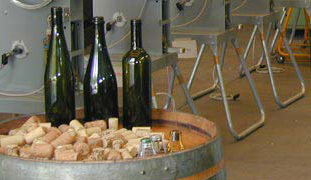 Our range of corking machines also include the TS 3 "Campagnola" corking machine and the GIS 4 Hydraulic caging machine for sparkling wine stoppers (or mushroom stoppers). Production volumes go from 800 corks per hour with the model Micra and up to 1800 corks per hour with the Automatic corking machine. All models of the Enolta Mapan corking and caging machines allow you to work safely. 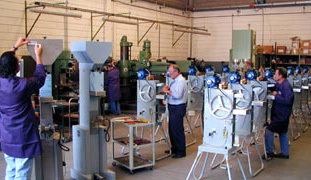 The experience Enolta Mapan technicians have gained working with the artisan production of every single machine makes it possible for the company to offer a product that is well-finished in every detail, and which guarantees reliability, precision, durability and compliance to current European safety regulations.